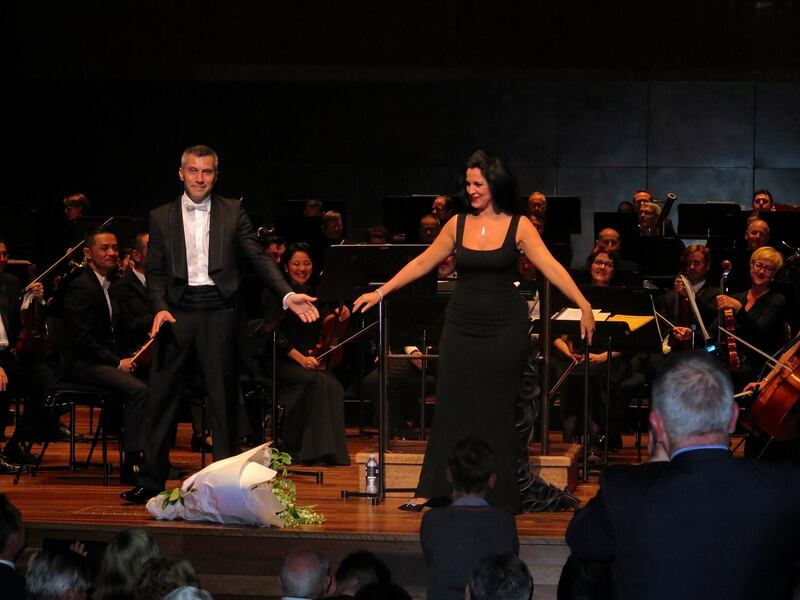 In a welcome and long awaited Australian visit, Romanian soprano Angela Gheorghiu demonstrated her finely honed artistry and the luxurious beauty of her voice along with the verve of her glamorous bella donna appearance. Known in Australia for her prolific recording career and her appearances in filmed operas screened in cinemas, Gheorghiu presented some of her greatest hits as well as some carefully chosen lesser known pieces in a thoughtfully curated program. Beginning modestly and almost tentatively, Gheorghiu warmed up mightily as the evening progressed to soar through well-known favourites in the second half. Fellow Romanian Maestro Tiberiu Soare conducted the Australian Opera and Ballet Orchestra, with a very clear highlight being the scintillating “Romanian Rhapsody” by Enescu in the second half. This epic suite highlighted crisp percussion and bold brass and featured many climactic moments. The orchestra actually began the evening a little slowly, with a somewhat muddy performance of selections from Handel’s Music for the Royal Fireworks. More successful was the “Intermezzo” from Manon Lescaut, in which the tune begins by travelling around the strings before building to a lush, atmospheric sound. Jane Rosenson on harp added an extra layer of quality to this piece. Gheorghiu made her first appearance in a filmy, strapless flesh coloured gown, with delicate matching shoulder wrap, adorned with a glittering silver brooch at the waist. Beginning with an aria chosen simply to display the sheer beauty of her voice, Gheorghiu followed the orchestra’s Handel prelude with “Lascia ch’io pianga” from Handel’s Rinaldo. Moving on, Gheorghiu gave a clearer picture of the dramatic ambition of the evening, in which she was to immerse herself in dramatic musical scenes. When absorbed in a role, such as in Manon’s second act aria, “Adieu notre petite table,” Gheorghiu shows great sensitivity, appearing delicate and vulnerable despite her highly attractive appearance. This quality continued through “Pleurez mes yeux” from Massenet’s El Cid. An aspect that occasionally interfered with Gheorghiu’s intense performance style was her use of her music on a music stand. The singer broke character, so to speak, to adjust the stand or adjust her wrap, particularly during musical interludes. While glancing at the sheet music interrupted visual engagement with the audience, a string bond nonetheless developed throughout the evening. The first half concluded with “Song to the Moon” from Rusalka (Dvořák), providing demonstration of Gheorghiu’s strength across an impressively wide vocal range. 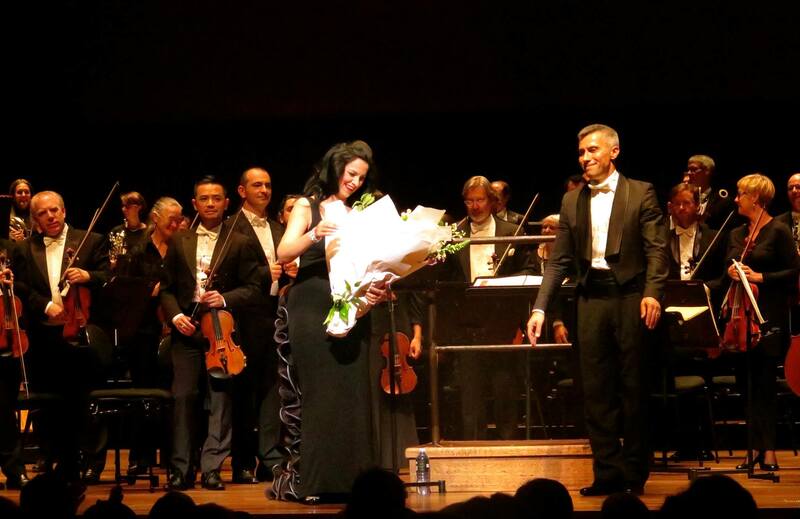 Projecting a demure countenance, Gheorghiu did not speak during the first half, but certainly showed herself extremely gracious towards the maestro and the orchestral players. Gheorghiu emerged for the second half in a voluptuous light cherry red gown with red shoes, her glossy black hair freed from the immaculate styling seen initially. 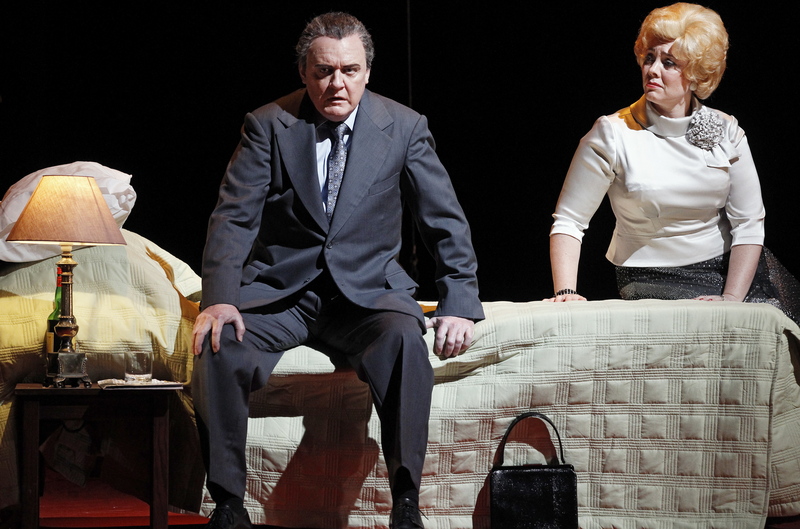 Performing well known pieces, Gheorghiu moved about more freely in the second half, unencumbered by reliance on the music stand. Her exquisite rendition of “Un bel di vedremo” gave a chance to hear her sing an aria from Puccini’s Madama Butterfly, a role she has recorded in full but has not played on stage. The sultry “Habanera” from Carmen (Bizet) gave the singer a chance to cut loose in a playfully seductive manner. Emerging finally in a backless, figure hugging black dress with dark grey train of ruffles, Gheorghiu performed one of her top signature arias, Tosca’s impassioned prayer “Vissi d’arte” from Tosca (Puccini). The formal program concluded with one last dramatic aria, “Sola perduta, abbandonata” from act four of Puccini’s Manon Lescaut (Puccini). 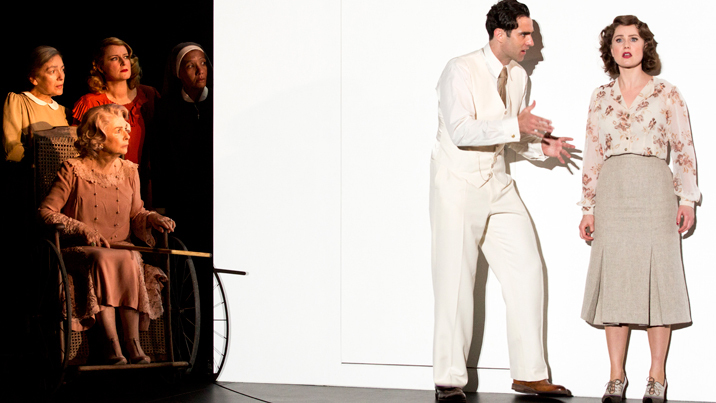 Finally addressing the eager audience during the curtain calls, Gheorghiu introduced favourite aria, “O mio babbino caro” from Gianni Schicchi (Puccini). Slowly spreading her hands, Gheorghiu seemed to almost physically draw the gorgeous final pianissimo note from her mouth. 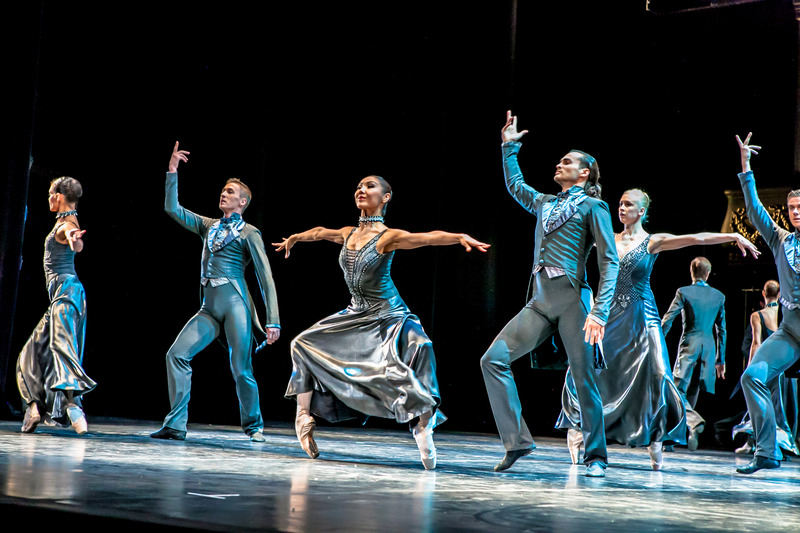 Well under the diva’s spell, the audience applauded rapturously at the evening’s conclusion. Gheorghiu had one last cheeky trick up her sleeve, exiting the stage with concertmaster Jun Yi Ma in hand. 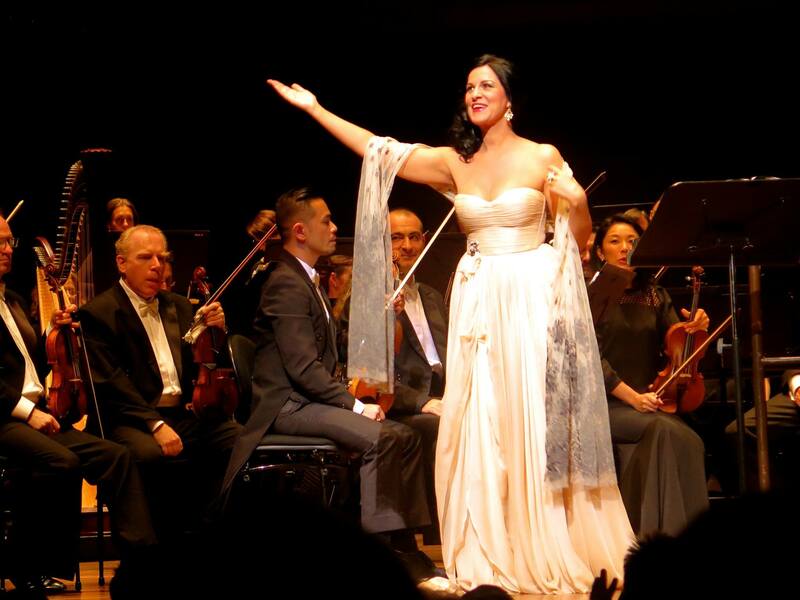 A Special Evening with Angela Gheorghiu was held on 13 October 2015 at Hamer Hall, Arts Centre Melbourne. I did not come under the Diva’s spell last night, I have been in love from afar with this sometimes naughty lady with the gorgeous voice for years. I sat at the start last night with the dread that the reality would not live up to the ideal, but Oh My Goodness, what a night. I think Angela just turns that magnificent voice on whenever she chooses; I was blown away. If I felt that she turned on that a capella just to show us she could do it, it didn’t matter (Angela chooses said Maestro Tiberiu), it was truly magnificent. And as for O Mio Babbina Caro, it has been performed by many and many times by Angela, but I cannot believe it was ever performed better than last night. I am drunk with the beauty of the notes she gave us as she brought the aria to conclusion; I will remember that always. She is the Dacian Queen. What a wonderful description John! I agree with your highlights – I was on the edge of my seat for Angela’s a cappella singing. And with confidence and flair she really hit her strides with O Mio Babbino Caro. I gasped at the conclusion of the final note. We have been so lucky with visiting artists recently. Long may it continue! Great account of the concert (I wasn’t there and you make me regret it) but judging from the pictures the concertmaster on the night was the AOBO’s associate concertmaster, Huy-Nguyen Bui. A belated comment: I thought the Gheorghiu concert the best of 2015, for the sheer magnificence of her voice, and the detailed work that she obviously had put in over the course of her career to deliver such deeply dramatic and accurate interpretations of each aria. Part of the appeal also was her divaesque aura. 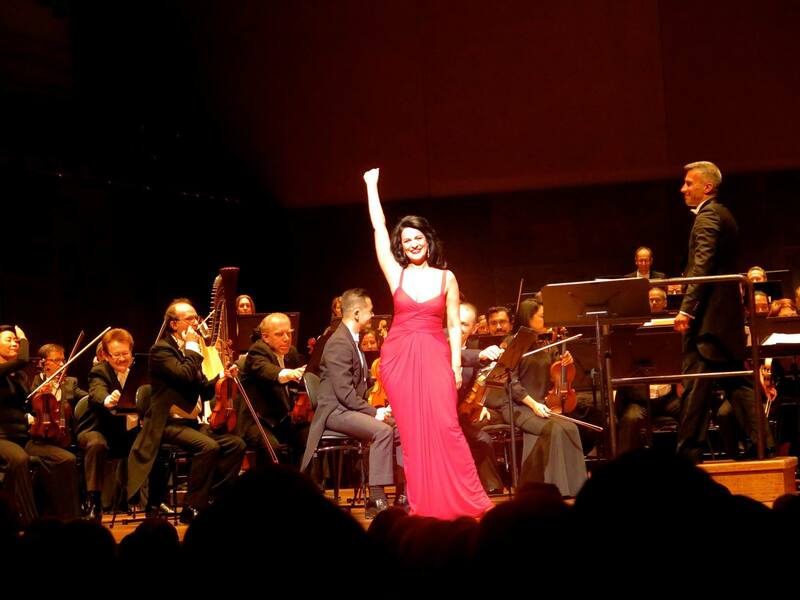 Thanks, Andrew, for sharing your thoughts on Ms Gheorghiu’s concert and also for sharing the article that includes the wonderful stage video of the incident from Tosca. I was unaware of the statement that Angela may or not have been making by arriving late on stage. How intriguing, and how very divaesque!